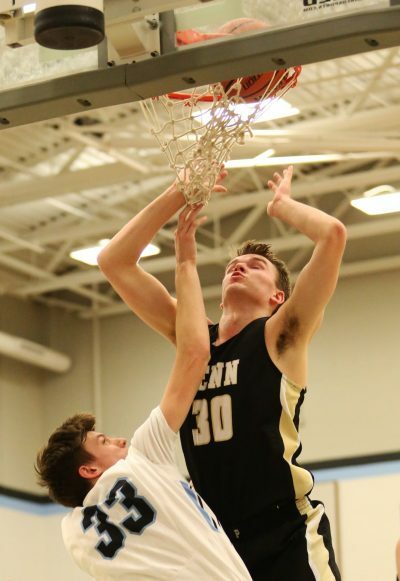 Penn overcame a 10-point deficit in the first half, but the Kingsmen were unable to erase another double-digit deficit in the second half as South Bend St. Joseph posted a 67-58 victory against the Kingsmen on Friday, Jan. 19. Drew Lutz scored 15 points to lead Penn. Noah Applegate scored 13 points. Noah Krathwohl scored 12 point. Kegan Hoskins scored nine points. PENN 58: Drew Lutz 15, Drew Schneider 3, Beau Ludwick 6, Luke Carlton 0, Noah Applegate 13, Noah Krathwohl 12, Kegan Hoskins 9. St. Joseph: Joel Strangebye 2, Brady Powers 23, Phillip Robles 9, Hunter West 16, J.R. Konieczny 6, Adam O’Dell 2, Ben Terry 3, Alex Mossey 6. Three-pointers: PENN 1 (Drew Lutz 1), St. Joseph 9 (Powers 3, West 3, Konieczny 2, Robles 1).